In our weekly review of homes that fall in love today we go to Hawaii to meet this dream penthouse located in the capital, Honolulu, and where the sun is the main protagonist; a sun that enters through a large windows to this cozy home decorated with personality situated 23 floors above the coast, which also favors enjoy spectacular views of the sea, the mountains and the city. We enter this house hoping you like it as we are, you join us? From the design studio responsible for equipping this stunning penthouse of over 300 square meters said they wanted to introduce textures and warm materials in the project through a modern aesthetic, while maintaining the elegance of the spaces without losing comfort. The designers have created a custom furniture pieces that have added classic vintage in a perfect combination between formal and informal, with a mixture of textures and using natural fabrics. We started the tour of the dining room, which highlights its chandelier Lindsey Adelman suggests a constellation that shines above a table as it seems to extend to the coast. Holly Hunt chairs are made of ebony wood with leather upholstery. 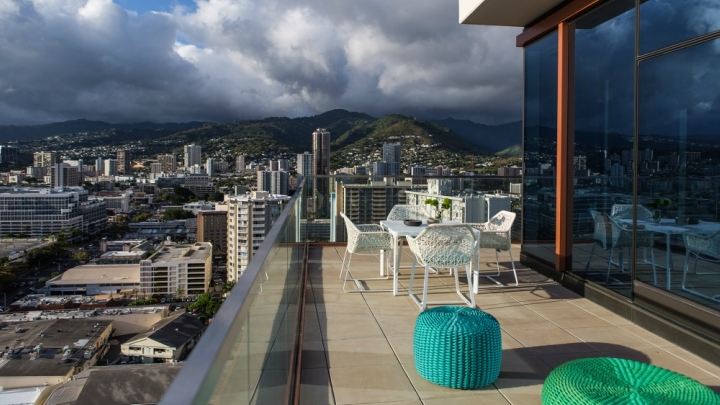 All custom furniture were made by local manufacturers shipped to Los Angeles and Honolulu. The living room becomes a perfect place to watch the sunset through the large windows that govern this space. Highlights the chandelier Brendan Ravenhill and a sofa in neutral tones that add splashes of color with cushions and accessories, which is able to give a more casual air to stay. The natural texture is incorporated through the classic mid-century chairs by Hans Wegner. Meanwhile, from the master bedroom you can access again to the wonderful views from this attic. With wooden floors and textiles in neutral tones, it has sought to offer an aesthetic that favors tranquility. On the other hand, in this interior design project it has been sought in those areas where there were dark wood this stay counteracted with lighter elements. In this room, for example, upholstered bed in neutral gray and carpet provide softness, complement the wood floor and table lamp vintage bronze located on a side table burr walnut Lawson Fenning. In the kitchen area we met some stools mesh design around an island that serves to connect and simultaneously differentiate this area lounge area and relax through a convenient and effective transition. 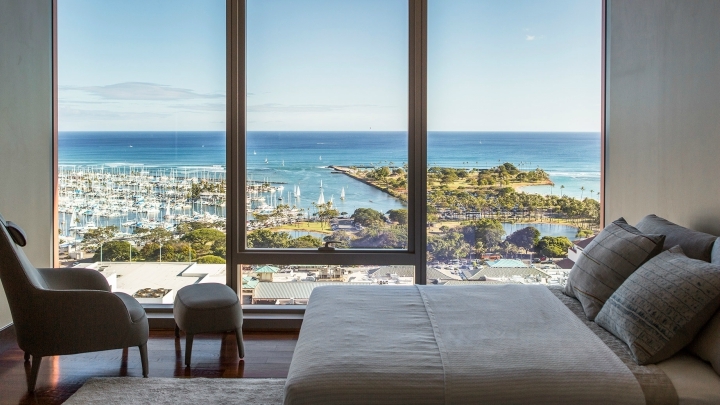 If from inside the attic to Honolulu views are spectacular from the terrace it seems that we go into all the splendor of Hawaii. The table and chairs are the Kettal Patricia Urquiola collection and bring the texture of the island to the outer space. The poufs Paola Lenti colors are. 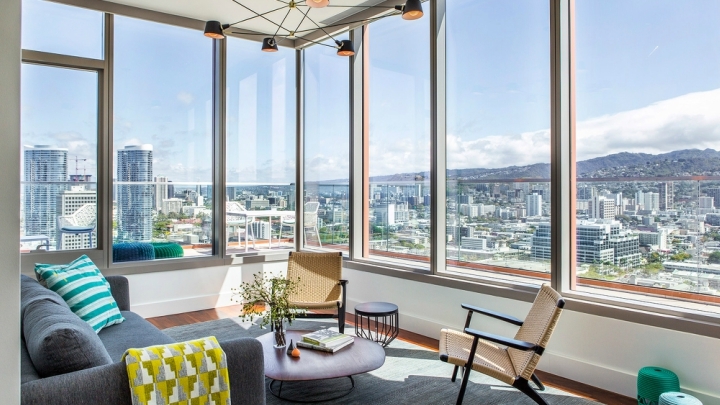 Then I leave you with pictures of Laure Joliet published in Lonny for you to discover every corner of this beautiful penthouse Honolulu we think you’ll like it a lot. Natural light plays a fundamental role in this apartment, with views that love. Enjoy them!